I've said it before and I'll say it again: I could eat Mexican food every day of the week. I love love love it! I have about a dozen go-to Mexican casseroles but am always looking for more to add to the collection. 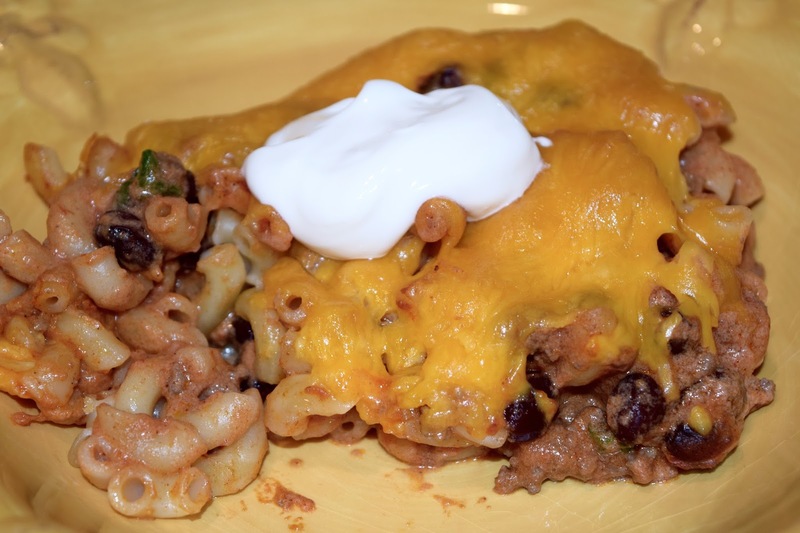 Especially in the winter months, is there anything better than a Mexican casserole? I think not. I really liked this one! I ate on this bad boy all week and was sad when the last helping disappeared. 1. Preheat oven to 375 degrees and spray a 9x13 baking dish with cooking spray. 2. Cook pasta according to package instructions and set aside. 3. In a large skillet over medium high heat, brown ground beef and drain any fat. 4. Stir in taco seasoning, green onions, enchilada sauce, tomato paste, black beans, and sour cream. Reduce heat to low and simmer about 5 minutes. 5. Add cooked pasta to your beef mixture and stir to combine. 6. Transfer mixture to your baking dish and top with shredded cheese. 7. Bake 15-20 minutes or until cheese is bubbly. I think my husband would really LOVE this! Thanks so much for sharing I will for sure have to try it out!! !